Add zing, wow, and pop to artwork with this set of eight fluorescent colors in oval half-pans. 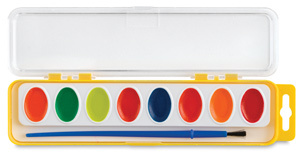 Colors include Yellow, Orange, Red Orange, Red, Pink, Blue, Green, and Chartreuse. A synthetic bristle brush is also included.